Ever since Apple’s release of iOS 6.1, users have been complaining about various problems such as battery drain, the Microsoft Exchange bug and more. Apple released iOS 6.1.1 for the iPhone 4S to fix the cellular connectivity issue, but now a YouTube user has discovered a new bug. A new bug in iOS 6.1 that lets you bypass a locked screen on your iPhone and gives access to all of your data. This bug was first discovered in January, but not many knew about it. Also, when it was first discovered by YouTube user videosdebarraquito, he was only able to view the Phone app and edit contacts, browse the Photos and make calls/send text messages. Watch how he does it in the video below. Go in to the emergency call screen, hold down the Power button until the ‘Slide to Power Off’ screen appears, and then press Cancel. Next, dial an emergency number such as 112 and immediately hang up. Now lock the iPhone and turn it back on to wake your iPhone. Hold the Power off button and tap on the emergency call button in about 3 seconds. You should now see the Phone app with your recent calls. To remain here, you’ll have to press the Home button immediately, which should take a screenshot. When I tried this on an iPhone 4S running iOS 6.1, I wasn’t able to remain in the Phone app. I had to continue holding the Power button to browse through the contacts etc. Try it out and let us know how it goes. Several users have confirmed that it indeed works. 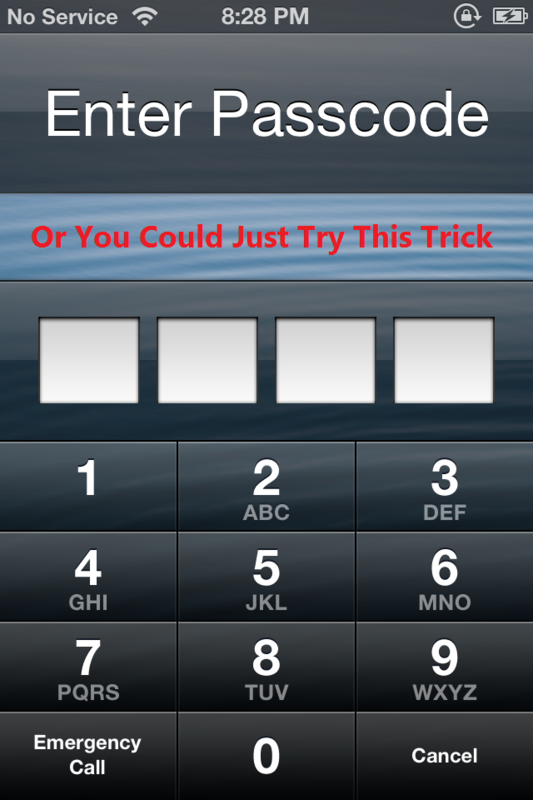 This lockscreen bypass trick also seems to be working on previous iOS versions such as iOS 6.0.1 and iOS 6.0.2. Apple are you listening? They released iOS 6.1.1 for the iPhone 4S with the connectivity bug fix, promised an update with the Microsoft Exchange bug fix, but now it’s time to get this bug fixed. I can’t seem to replicate this issue on my iP5???? I agree, it is hard enough to follow what to do reading it, but figuring out these steps on your own seems mind boggling. Maybe after doing this glitch, you could dial *3001#12345#* to access field test mode and maybe that will get you to the home screen? Someone test this please. This is a reply to Ethyn Resausk.